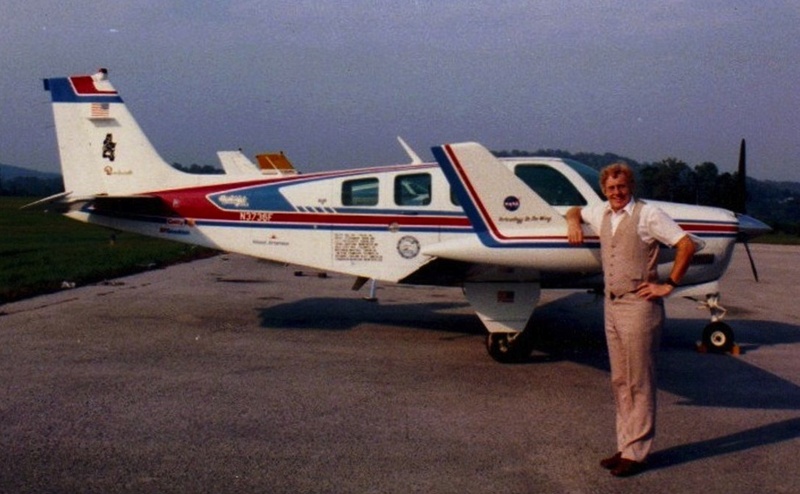 In 1981 Calvin Pitts made a round-the-world flight commemorating the 50th Anniversary of the Post-Gatty RTW Flight in 1931. 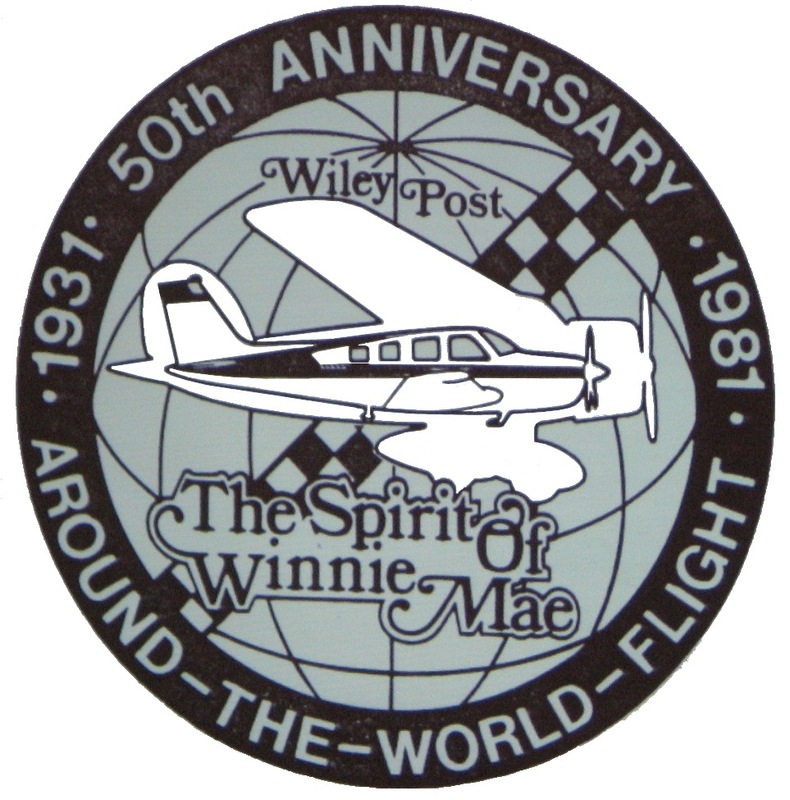 The flight was sponsored by the Oklahoma Air & Space Museum to give honor to Oklahoma aviator, Wiley Post. "Re-living it afterwards, especially after all these years was the greatest adventure of my life." NEW YORK, NY:  Scheduled to depart from NY, but ATC controller's called a strike June 22nd, the day before our departure. 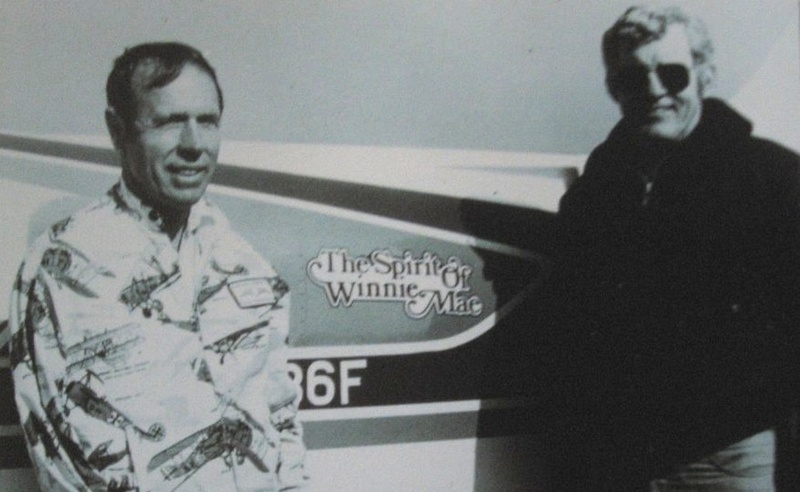 MANCHESTER, NH:  Departed June 23, 1981, the day Post & Gatty left NY after a 2-month Atlantic-weather delay in NY. ST. JOHN's, NEWFOUNDLAND:  Fuel and Atlantic flight plan filed. MANCHESTER, ENGLAND:  Our King HF radio failed over the Atlantic due to a hidden, broken antenna wire (as we found out much later). searching for a technician found no one. sitting on the apron, engine running, waiting for takeoff clearance. Controller said:  "British controllers have just called a strike. controllers . . . who offered to take us across the North Sea to Germany. due to the requirement of an HF radio over Siberia. For mechanical reasons, he was "stood up." Not good, but couldn't be helped. clearance across Siberia. However, and here's the big but . . .
canceled our clearance, which obviously was the intent. We were being punished ... with a smile. Back in Frankfurt, we re-planned and re-routed our flight south to Australia and across the Pacific, a mere 10,000 miles further. turbo-charged. Forced to think quickly, I passed the "T" off as a turbine, else we would still be in Frankfurt. Legal? I just wanted out of Germany. Regulations were strangling us. How do people live under such tyranny? due to weather), was a test of nerves as we approached a massive thunderstorm cell directly in front of us. "Do we dare deviate?" "No, don't think we should." "Better to risk getting shot down than take our chances inside that black beast?" "Don't know." As we approached the ugliest black cell on earth, which I can still see today, it slowly began to separate. Is this embellishment? Berlin gave us the red carpet treatment, one of the few times. with the over-grossed weight. The long legs required that much fuel. An armored tank on rubber tires brought 8 armed military men to tell us that it was illegal in Greece to work on your own plane. Greek Air heard me talking to an official, and privately offered to help. He loaned us one of his mechanics while we did the work. The rest of the trip was made without flaps. I calculated $20 times 10 offices, I told him I didn't have that much. said, "I'm going to call the authorities in Cairo and tell them you're bribing pilots." Something must have registered because he said nothing. The bullet in the back never came, so we took a taxi to a hotel-of-sorts. to a hotel, an Egyptian met us who was one of the controllers that had heard about our ordeal ... and was laughing about the "stand-off." He gave me the name of the top aviation official in Cairo, with a phone number, and suggested I call him. When I did, and explained who we were and how we had been threatened and bribed, he said he would take care of it. He did. sell us fuel. Now they asked how much we needed, and said there would be no charge. From bribes to "bless your sweet American heart"
ABU DHABI, UAE:  USA oil money at work. We've built a futuristic city there. No flight problems. the radar indicated. Before I knew it, we were climbing with the nose pointed downward. It was impossible to maintain altitude. We were inside a cell which was visible, neither by eye nor by radar. remains would be reported back home. If my head had not been pressed back against the headrest, a broken neck might have resulted. It was a fairytale ride ... all free of charge. a counter for a cup of coffee. A local man saw the far-away look in our eyes, and asked if there was something he could do to help. learned a cultural habit which was new to both of us. gracious, standing there in case ... In case? some privacy. This was a mild culture shock, for sure. ... because we're looking for a wife ... because we're spies ... because we're hungry. Maybe because we need fuel. I don't know. Why do people ever go to Indonesia?" I sent a message back to our home base in the States ... "Precautionary landing in Indonesia for fuel. Very strong headwinds. in Indonesia big winds we are OK."  We didn't know it, but at the time of the message, the home folks thought we had crashed. Just a minor mistranslation. They were glad we weren't hurt. I was glad we weren't shot. INDONESIAN OUTPOST:  The Indonesian officials said we would have to go through Customs and get a new clearance at a different Island. delay ... delay. The sun was setting, and I knew we needed to get out of there while we could still see the surrounding mountains. letter of explanation when we get to the States? Let's head for Australia, and file a flight plan en route via the HF radio." to friendly territory"  Not a word was said to us in Darwin. Guess they don't like Indonesia either. DARWIN, AUSTRALIA:  Short, sweet, friendly visit. No time for a trip to the Outback. But the fuel was ... I think ... over $5 a gallon. continued to hold good -- a RTW flight when gas prices are at their highest. How much better does it get? just beyond the airport. But their VOR was working very well, so the approach and landing was without incident ... until the next day. Since my father had been there in combat during WW-II at Milne Bay, I wanted to visit the site of many of his stories. and beautiful that we weren't looking for traffic. There couldn't be any other planes in such remote territory. But there was. witnesses, I would have lost my head. when a native with 9 wives walked up out of the bush. Our bushman friend spoke pidgin English, so I tried my hand at it, having practiced a little the night before with our waiter. wanted $10 for a $.50 necklace. But I bought it just to stay out of his cooking pot. hungry. Flying low along the beach, many of the natives waved at us. Never before, never since. I could hardly wait to tell my father. As we were thinking about leaving, a NZ-FAA inspector said he would like to chat with us. "Are you fellows planning to leave soon?" Milne Bay. You cut off a C-310 on a straight-in approach. And what else?" I was told to make ... and the C-310 made no calls, so he cut me off ..."
(broken regulation), you ran out of fuel in the air (broken regulation), and you had to make a dead-stick landing (broken regulation). and not come back. Yessir. dump, was still off-limits. Lots of other war stories and people we met. hurt them, I guess. But it made me weak to think about it. Guadalcanal was the greatest. that the Omega conked out on us, and we didn't get it back until long after leaving Tarawa. the chart, I turned toward Tarawa and climbed back to 9000 feet. The ADF had been previously set to Tarawa's frequency, but there was no guarantee that the ground facility would be turned on. We had been told that often they do not transmit. But at a hundred miles or so, the needle began to quiver, then come alive. anything?" "No." "Me neither." Looking ... looking ... looking. Nothing. from seeing it at an angle. of fuel on landing, maybe more if the tailwinds picked up, which they were doing. location of Moffett Field and San Jose. our ferry tanks dry, were on the wing tanks, and they were showing that we would have less than 1 hour of fuel when we landed. But at least we were in sight of land. Then the skyline of SFO began to materialize. I corrected a little more to the south. We were H-O-M-E . . .  well, almost. pompass officials, weather, fuel calculations, mechanical and electronic problems, all now seemed like something from a past dream. of challenges had brought us 22,000 miles in 148 hours. (plus 2,850 miles & 19 hours). But we still had 2,850 miles to go. No sweat. checked some mail, then headed East. grew up, and pressed on for the last leg. happened at night over the Pacific, 8 hours from land, it might have caused a bead of sweat or two. who could pull and replace fouled plugs while flying. Didn't even think of him. was with us in life-and-death situations, it is enough to humble anyone. 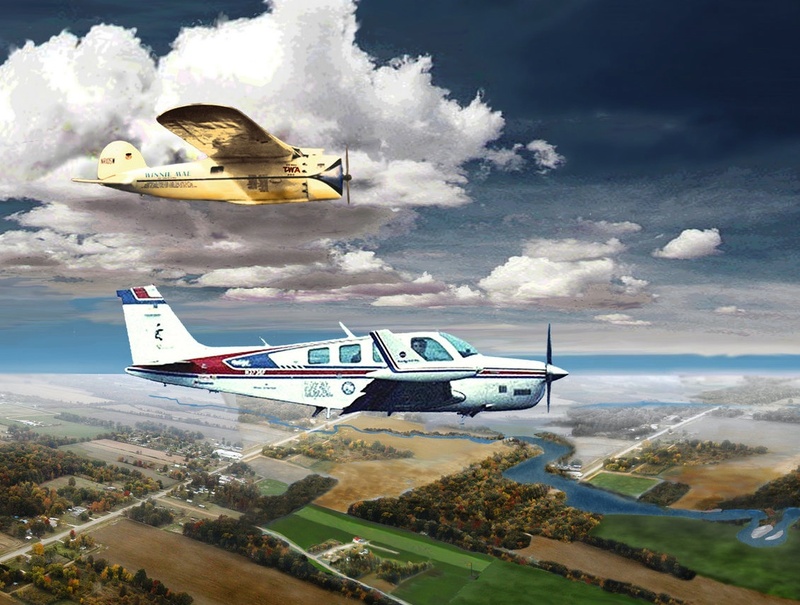 Wiley's first plane was named), and various others. shouldn't be real, but it is. It is as impossible to believe as the flight which I have just partially described. So what to do? CLOUD" will see the light of day. AFTERWORD:  The red tape and political regulations cancel out any technological advantage modern pilots may have. brought many new friends with hours of interesting conversation. "Would you do it again if you had the chance?" "At this age, I'll ... Wait. Are you making an offer? Let's go." "Re-living it afterwards, especially after all these years, was the greatest adventure of my life."